John Robert Bolton (born November 20, 1948) is an American lawyer and diplomat who has served in several Republican administrations. Bolton served as the U.S. ambassador to the United Nations from August 2005 until December 2006 as a recess appointee by President George W. Bush. He resigned in December 2006, when the recess appointment would have otherwise ended, because he was unlikely to win confirmation from the Senate in which a newly elected Democratic Party majority would be taking control in January 2007. Bolton is currently a senior fellow at the American Enterprise Institute (AEI), senior advisor for Freedom Capital Investment Management, a Fox News Channel commentator, and of counsel to the Washington, D.C. law firm Kirkland & Ellis. He was a foreign policy adviser to 2012 presidential candidate Mitt Romney. Bolton is also involved with a number of politically conservative think tanks and policy institutes, including the Institute of East-West Dynamics, the National Rifle Association, the U.S. Commission on International Religious Freedom, the Council for National Policy (CNP) and the Gatestone Institute, where he serves as the organization Chairman. 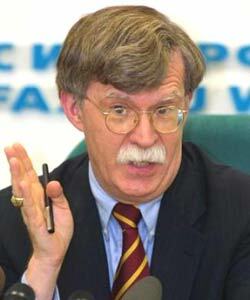 Bolton has been labeled as a neoconservative, though he personally rejects the term. He has been a prominent participant in several neoconservative groups, like the Project for the New American Century (PNAC), Jewish Institute for National Security of America (JINSA), and the Committee for Peace and Security in the Gulf (CPSG). National Security Adviser John Bolton at a cabinet meeting at the White House, April 9, 2018. (Reuters / Kevin Lamarque). We've said our farewells to McMaster, Who all hoped would stave off disaster. We've now got in charge. A nutcase at large. The end of the world may come faster. Ad Policy. WASHINGTON — The last time — perhaps the only time — John R. Bolton inspired bipartisan agreement, it was over the shared conclusion that he was perhaps the least diplomatic personality a president could have ever picked to be an American diplomat. That was in .... “John Bolton is not that person.”. Secretary of Defense Jim Mattis was caught making a funny remark to newly appointed national security advisor John Bolton while meeting him for the first time on Thursday. "I heard you're actually the devil incarnate and I wanted to meet you," Mattis said jokingly while walking up the steps of the Pentagon. Welcome to Best of Late Night, a rundown of the previous night's highlights that lets you sleep — and lets us get paid to watch comedy. If you're interested in hearing from The Times regularly about great TV, sign up for our Watching newsletter and get recommendations straight to your inbox. Did Trump campaign and John Bolton PAC get help from overseas? President Donald Trump's announcement on March 22 that John Bolton, the former U.S. ambassador to the United Nations, will replace Army Lt. Gen. H.R. McMaster as national security adviser has shaken the foreign policy world — a world that doesn't like to be surprised, much less caught off guard. In 1994, John Bolton said that if the United Nations Secretariat building in New York “lost 10 stories, it wouldn't make a bit of difference.” The quote makes an appearance nearly every time Bolton's critics compile a hit parade of his alleged infamies. My question is: Why is the remark even controversial? President Trump's national security adviser is stepping down. Trump tweeted that Lieutenant General H.R. McMaster will be replaced by former ambassador to the United Nations John Bolton. NPR White House correspondent Tamara Keith is with us now to talk through this latest development. Hey, Tam.